For the last year and a half, since June, 2017, we have been at Sunset Bay Marina in Stuart, Florida. 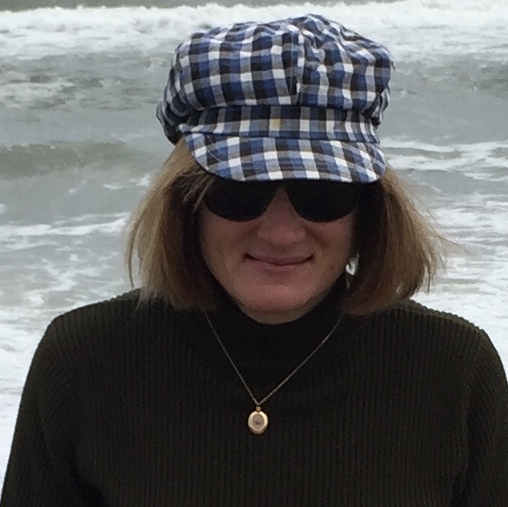 Oddly, I did not post a blog about our stay in Spanish Wells and another one about our cruise back to Florida at the end of our sixth trip to the Bahamas. I thought I had, but haven’t looked at our SV Seas the Day website since returning. Here is a brief summary of the last month of our Bahamas Cruise in 2016/2017. We stayed in Spanish Wells until May 22, 2017. We then sailed directly back to Lake Worth, Florida, leaving Royal Island, near Spanish Wells, at 10:05 am and arriving at Lake Worth the next morning on May 23 at 6:30 am. We had to slow down at the end so we could enter Lake Worth in the daylight. The next day we traveled north on the ICW back to our home port of Sunset Bay Marina in Stuart. 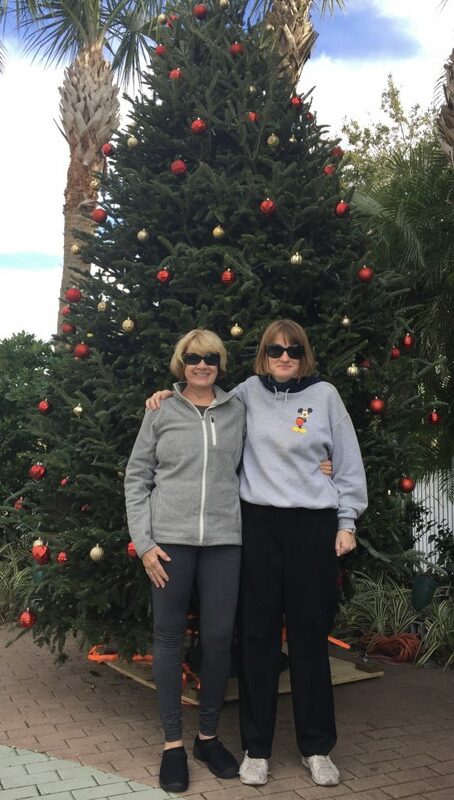 We didn’t go to the Bahamas the following November, 2017, due to some medical news we received after returning to Florida. Mark had a physical and his PSA had risen. Over the summer of 2017 it continued to rise until he eventually had a PETscan which showed cancer in his prostate that had spread to his spine. Chemotherapy began in the Fall but after horrendous side effects, his oncologist changed the treatment to a hormone injection every three months and daily hormone pills. There were no side effects, Mark gained back the 25+ pounds he had lost during chemotherapy and he got his hair back. After a few months, he felt 100% better, changed his diet from mostly sugar to mostly organic and has been healthy ever since. A PETscan a few weeks ago in October, 2018, showed the cancer is gone from his prostate and spine. However, the hormone treatment will continue for the foreseeable future. We had decided shortly after his diagnosis that we would go to the Bahamas for the 2018/2019 season and that is what we are doing. He will have to fly back to Florida every three months for his injection and have his hormone pills mailed to him each month in the Bahamas. For this reason, we will quickly get to Georgetown, which has a good airport nearby and stay there until April. Then we will go directly to Spanish Wells for the rest of the season. Spanish Wells also has an airport in nearby North Eleuthera. So what have we been doing for the last year and a half? First, as always, we made some changes to Seas the Day. For example, we have never liked the one inch deep cushions in the cockpit. We have a large seating area around the table, but it was uncomfortable. Therefore we had new cushions made, now much thicker and very comfortable. In the previous post, you’ll see an older photo of our cockpit seating with two boat chairs in the corners. Since the padding was so thin we always put these chairs on top of the cushions. The new cushions are the same color and material as the old ones, so they look similar, just feel different. 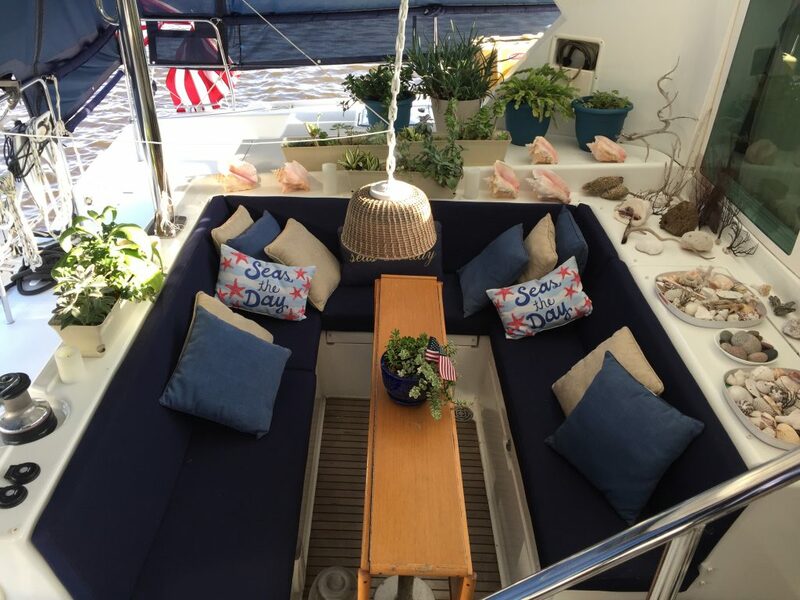 In the picture are two of our new Seas the Day pillows. Mark also sanded the drop leaf table he made several years ago and put a new coat of finish on it. Also in this picture, we changed the chain for the hanging lamp, since the old one had rusted. At the same time, we replaced the helm seat. We had already had a new one built a few years ago since the one that came with the boat was extremely uncomfortable. However, that replacement was not exactly what we wanted so now we have a seatback that is high with a thick cushion seat. Our sunshade panels in the cockpit were starting to wear out so we had new ones made, once again the same color and material as the old ones. We were never satisfied with the SPOT satellite location device we have used since 2008. Sadly while the tracking was good, it disappeared after a week. Therefore we have no online record of all of the places we visited during the ten years we have cruised on Seas the Day. SPOT was the only device available when we moved aboard, but a few years ago the inReach device became available. Starting with this cruise, we will be using an inReach and the track is permanent. It also includes the ability to add a message, along with many other desirable features. Our new tracking link for inReach is here. It can be found on the menu of our website under “Location.” Each time we move, we will turn the tracking on and it will update our new location every ten minutes. At the end of that leg of the cruise, the tracking will stop and I will write a short message about the trip on the inReach page. When Hurricane Irma came through Florida in the fall of 2017, we had to evacuate. This is the first time we had to leave town for a hurricane. We drove 28 hours to Knoxville, Tennessee, and stayed there for one week. Under normal conditions, this trip would take us less than 12 hours, but of course the roads were clogged. 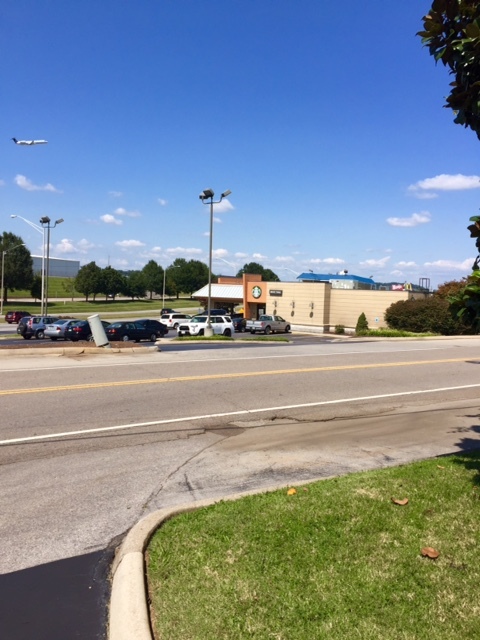 However, when we arrived in Knoxville we stayed at a wonderful LaQuinta which was across the street from a Starbucks. The Treasure Coast of Florida includes the counties of Indian River, Martin, St. Lucie and Palm Beach. In other words, it runs from Vero Beach, south to Palm Beach with Stuart in the middle. Amazingly, while Irma went through most of Florida, the Treasure Coast was hardly touched. We returned to our marina to find there was no damage to our boat or the marina as a whole. When we knew we were evacuating, we of course removed the sails and everything that was on the deck of the boat. Since we were worried about losing power, we purchased an Engel refrigerator/freezer and planned to empty our freezer and bring the food with us. Unfortuately, the Engel did not arrive in time so we had to give away our frozen food. However, now we can use the Engel while cruising. It uses much less power than our current freezer and can also be used as a refrigerator. During our last Bahamas cruise, a cruiser friend (Penny from M/V Pretty Penny) sent us a photo of a display she saw at a local Florida store, Bealls. Everything had “Seas the Day” written on it. Of course, when we returned I immediately visited Bealls and bought numerous items with our “logo” on them. Now we have new cups, insulated glasses, rugs, wine glasses, plates and trays with the name of our boat on them. I don’t know why anyone else would want something with Seas the Day on it and of course they were all on sale for that reason. After getting the results of Mark’s PETscan a few weeks ago, we began to seriously start to provision and make purchases of spare parts. Mark was very busy with the “to do” list he had been avoiding for awhile. Provisioning was very different from past years since we are now eating very little meat, lots of veggies and fruits, and whenever possible “organic” foods. Our eggs and chicken breasts are from free range chickens, our beef is from grass fed cows and our salmon is “wild.” We did end up buying quite a bit of meat with those qualifications, which of course meant everything was more expensive. We saved a lot by not buying massive amounts of candy (for Mark) and ingredients for all the cookies, Rice Krispie Treats, and homemade caramel rolls I regularly made while in the Bahamas. Instead of coffee, we bought green tea. We didn’t have to buy any cases of Coke for Mark. As always, we have to make preparations for Sailor. A few months ago I sent away for the paperwork he needs to enter the Bahamas. He had his yearly physical, during which our vet signed the Bahamas paperwork. Provisions for Sailor are seven months of food, treats, Heartguard meds, Nexguard (flea and tick), shampoo and conditioner, and one final grooming. 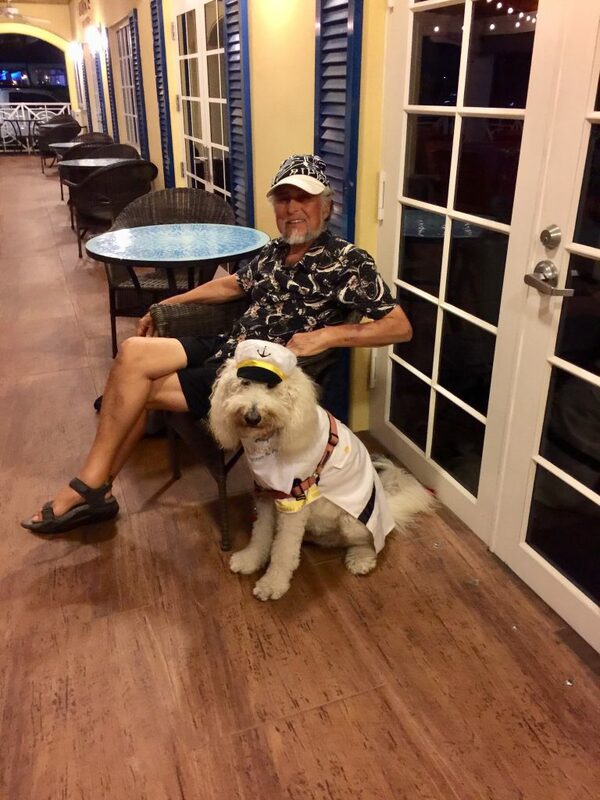 Speaking of Sailor, I’m sure he has missed running on Bahamian beaches, but he has enjoyed his twice daily very long walks preceded and followed by sitting on the marina porch. Now that we are ready to go, as usual something breaks at the last minute. This year our freezer is not freezing. While we have the Engel, we bought too much and the excess frozen food was placed in our large freezer. Tomorrow Mark will order the part we need and in the meantime, another cruiser is having freezer problems too and they have friends who have an empty freezer in a house, so we were able to put our freezer contents in it. Whew! I have lost count of the number of times our freezer has failed and we have lost massive amounts of food. Tuesday, November 12, was a good day to make the three day trip to Miami, but we won’t be able to do that. As usual at this time of year, fronts pass through Florida and delay our departure from Stuart. We should get another window to leave at the end of the week. Below are a few photos of our activities from the last year and a half. 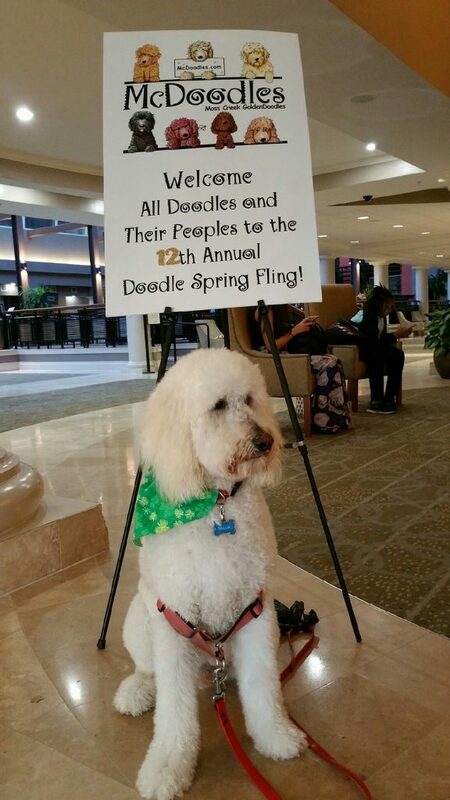 In March, 2018, since we were in Florida for once, we were able to go to the Spring Fling, an annual reunion party put on by Sailor’s breeder Moss Creek Goldendoodles. We drove to Orlando and stayed for several days in a hotel. 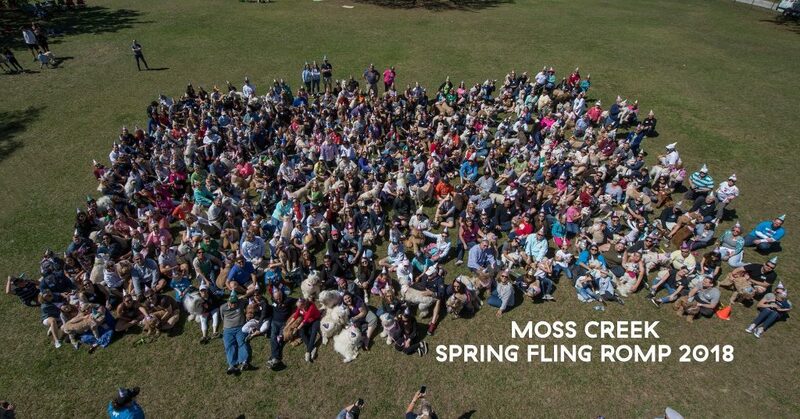 The romp was held outside of Orlando, where Sailor got to play with hundreds of his relatives. Sailor has worn the same costume for every Halloween of his five years. 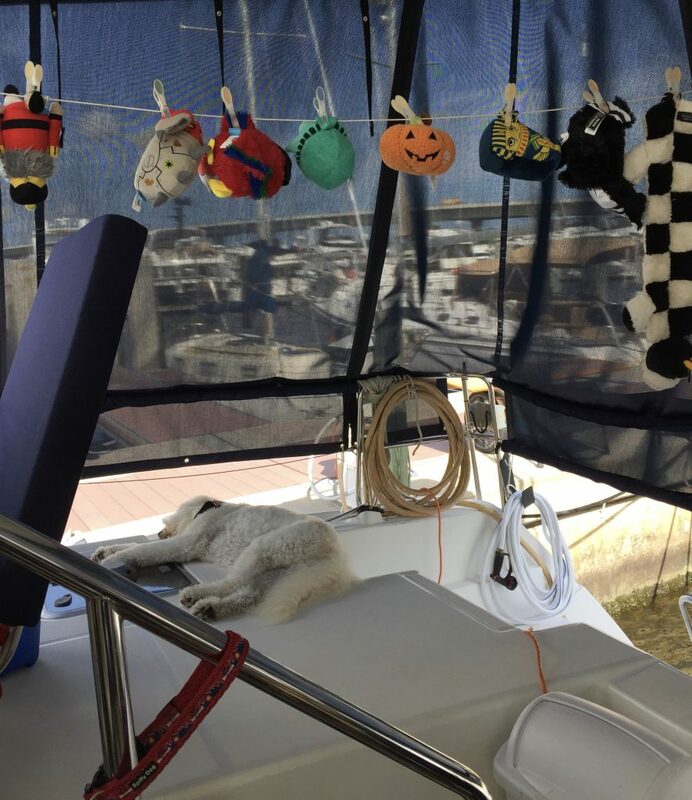 Before he came home to us, I had already purchased his sailor costume in small, medium and large. He’s a good sport about wearing it. In the Crew section of this website, you’ll see a photo of Sailor the day we got him wearing his size small sailor outfit. Sailor has a BFFF (best furry friend forever) named Zorro. 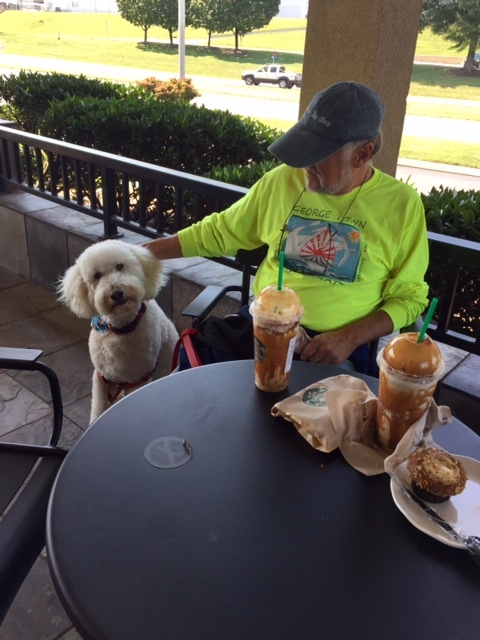 His dad Chris visited us in the spring of 2018 at our marina in Stuart on their way to the Bahamas. 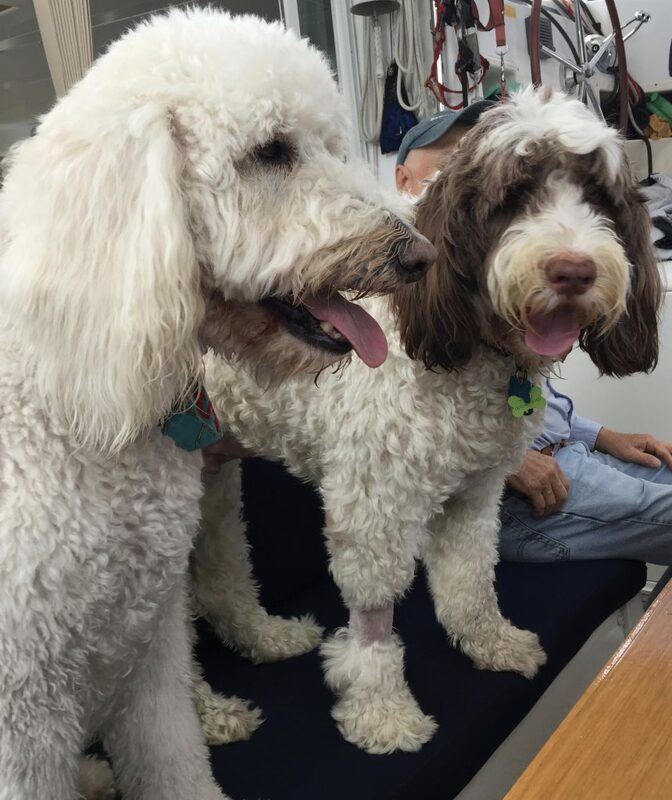 Zorro fell off a dock at Vero Beach so he couldn’t run and play with Sailor. 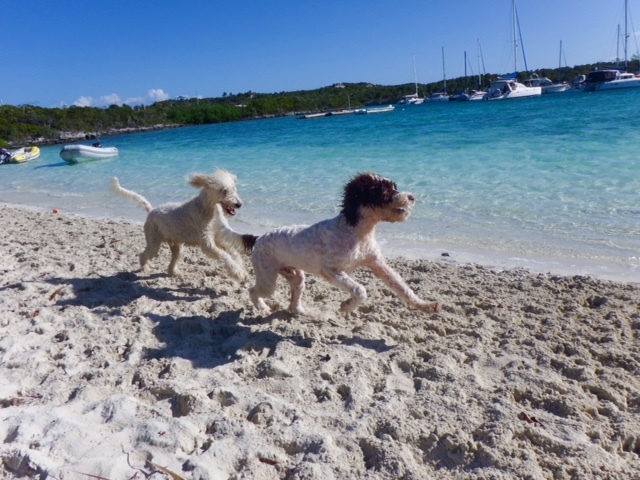 However, in the second picture of them they were running together on the beach in Hole 2, Georgetown, Bahamas several years ago. While I didn’t write about our visit to Spanish Wells in April and May of 2017, below are two of my favorite pictures from this island. 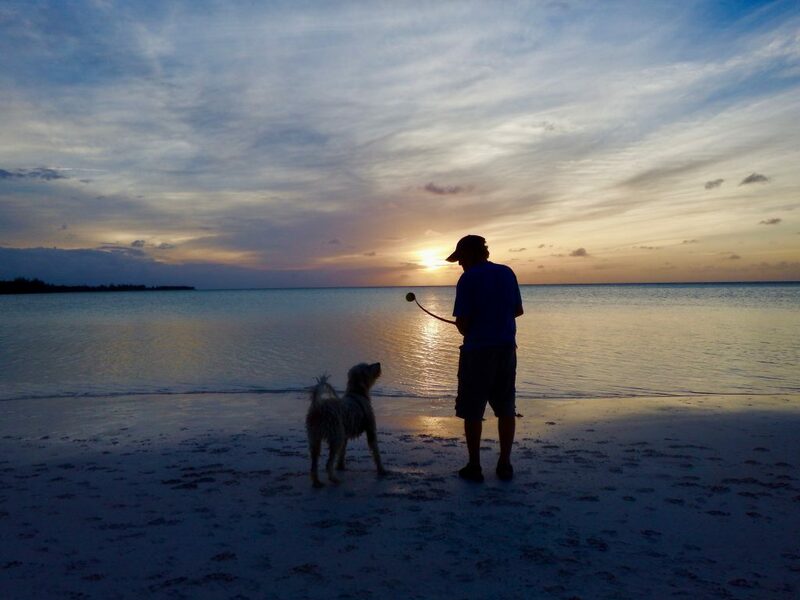 I had hundreds to choose from and selected one of Mark and Sailor playing “fetch” on the beautiful Spanish Wells beach. 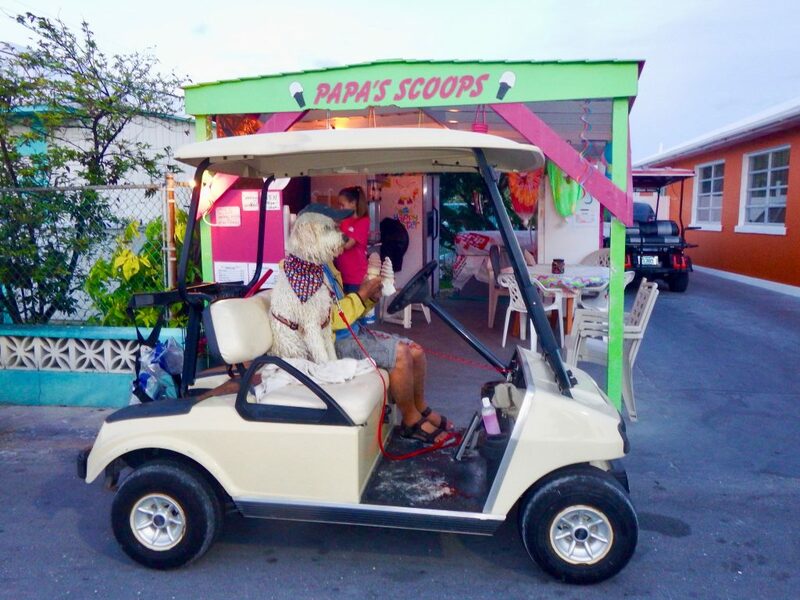 The other is a picture of our favorite activity in Spanish Wells – going to get a soft ice cream cone at Papa Scoops. We always rent a golf cart for the month we are there, which makes it easy to get to Papa Scoops, which is only open in the evenings. One advantage of staying in Stuart last season was I got to have my daughter Jennifer visit more often. It was especially nice to be with her during the Christmas season. We always went to the beach when she came on her once a month visits. Her dad had surgery during the summer and she got to stay with us for a month, not her usual three day visit. 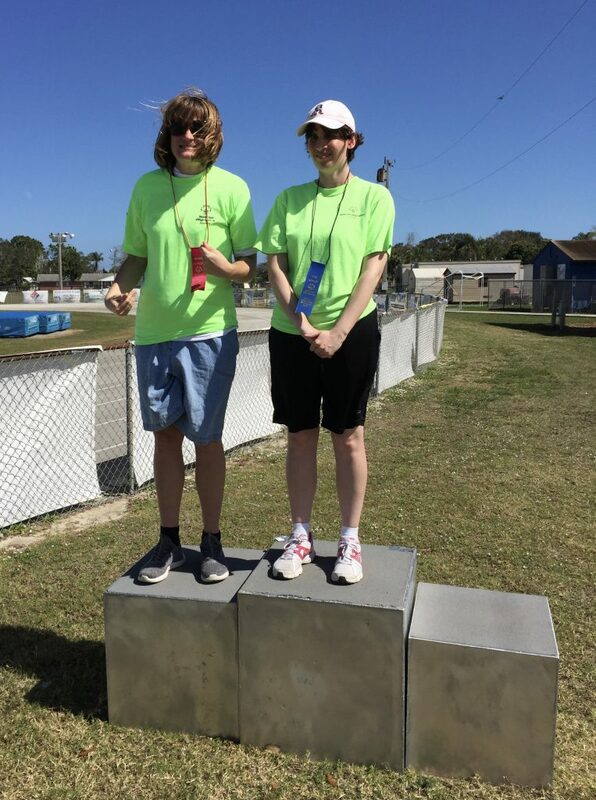 I also got to go to some of Jen’s Special Olympics meets. Below she was competing in a track meet. Loving to win, she was very disappointed that she got second place. Finally, while at a dock we have unlimited city water, so of course we do as much washing as possible before we leave. Besides washing pillows, quilts, curtains, dog bed covers, and rugs, Sailor’s toys got baths. He is used to this so he slept through the whole process. Below are a FEW of his toys. 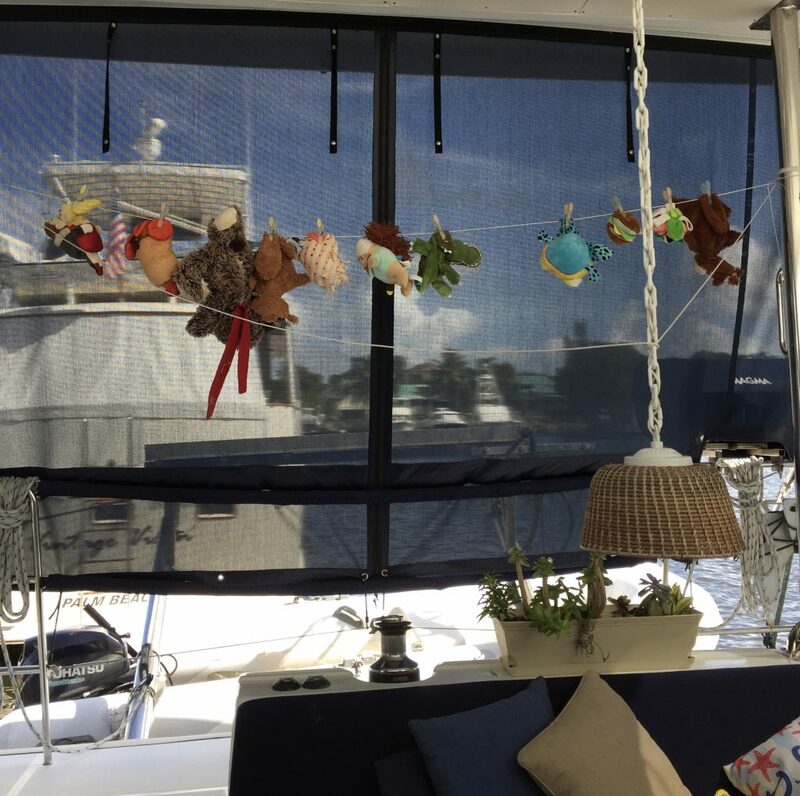 This entry was posted in Sailing and tagged Eleuthera, Governor's Harbour, Sailor, Spanish Wells on November 12, 2018 by Jan.